The Assassin’s Creed franchise has expanded out from its video game origins to encompass comics, movies and even novels. 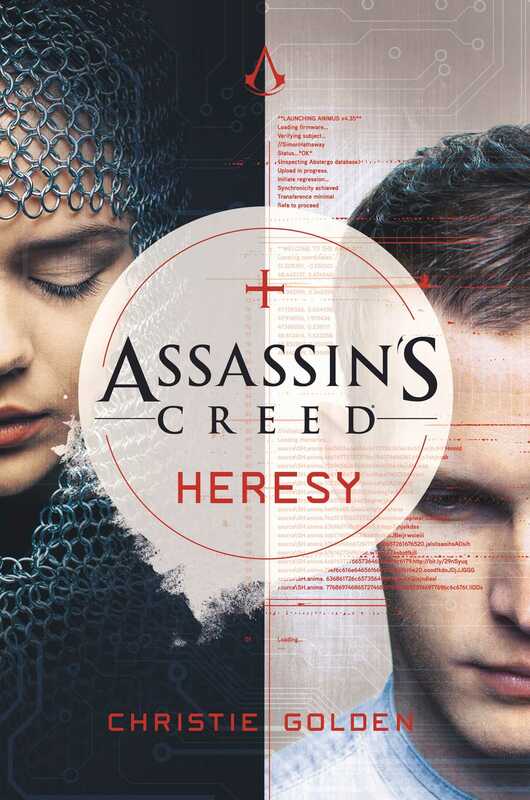 With Assassin’s Creed: Heresy, author Christie Golden has stepped into a well established world to pave a new path. The story takes some bold moves that set it apart from the games, yet it still weaves its way into the fabric of the universe populated by Templars and Assassins. Whether you are new to the franchise or not, Heresy is a book with potential. I can’t say it is for everyone, but if you’re like me, you may find yourself engrossed in the story and the characters for an intriguing ride. Now to set the stage, I’m a bit of a noob when it comes to Assassin’s Creed. I’ve played a little bit of the video games, but I’ve never paid much attention to the story. I also skipped out on the movie. Furthermore, Heresy is the first piece of Assassin’s Creed literature that I’ve dived into. Thus if you don’t have much exposure to this franchise, I’ve got you covered. For those who are deeply invested in it, I can only speculate how this book will play out for you. However, I can say it was unexpected. For starters, I expected the story to follow a character who would be travelling around in time assassinating people and learning the art of the Assassins. That isn’t what this book sets out to do. Instead, it stars a Templar, one of the bad guys as portrayed by just about everything else out there relating to the Assassin’s Creed universe. Normally the Assassins are the good guys and they fight the Templars. However, this book spins that around to show the perspective of the Templars. Rather than painting them as an entire organization run by evil people, it shows that there is much more to them that was has previously been told. Taking place in both the past and the present, the book tackles two time periods and two main characters. On one hand it explores the Hundred Years’ War and centers on Joan of Arc as she adventures out on her mission to save the people of France. For this trip through history, the viewpoint character is a man named Gabriel who devotes himself to Joan and follows her through victory and defeat. In the modern day, the main character is a man named Simon Hathaway who is a member of the Inner Sanctum of the Order of the Templars. Simon has taken it upon himself to show how much more useful the Animus can be when used from a broader, historical perspective. He hopes to travel through the memories of his ancestors to discover the mystery of Joan of Arc and her sword. You see, in this book, in this world, there are magical items called the Pieces of Eden. They are relics of an ancient civilization called the Precursors. The Templars hope to use those relics to drive forward their own goals of unity and order in the world. By traveling back in time through the Animus and reliving the memories of his ancestor Gabriel, Simon hopes to observe the power of Joan’s sword which happens to be one of the Pieces of Eden. These two narratives interweave into a double mystery. Simon tries to unravel the mysteries for his own gains in the present while navigating the complexities of the Templar Order and internal power plays amongst its members. Through the trips to the past, the reader is exposed to the life of Joan of Arc. We get to see her powers, her triumphs, her struggles, and eventually, her downfall. The mysteries of Joan’s life are explored in a gripping tale all of its own. Yet those jumps into the past are interwoven with the pressing turmoil of the present. On the surface, Simon might seem trivial and boring, yet his real world life is very grounding. It gives readers something they can relate to. His trips into the past are an escapism that, as a reader, we can equally bond with. That need to escape the real world and explore something else is a desire in all of us. But for Simon, these trips into the past reveal mysteries that pose a great danger to his wellbeing in the present. Discovering the mysteries of Joan of Arc could very well unravel the Order of the Templars. One thing that is very different about this book, and it might be a stumbling block for gamers, is the lack of action and violence in this novel. For a story involving Assassins and plunging back into history to explore battles between the French and the English, there is very little violence. Simon, being a historian first and foremost, is very non-violent, and reliving the carnage of bloody battles is something that shocks him. On the flip side, Joan of Arc is also a very non-violent character. While she led people into battle, she herself never killed anyone. It’s actually really surprising how the book manages to avoid violence without hurting the story. To be honest, it’s refreshing. With so much violence in the world and in every medium we consume, to read a book where violence is minimalized is kind of a nice break. However, I could see where it might not be for everyone. A lot of the focus in the games is going around as an Assassin and stabbing people with the hidden blade, sword fighting and, well, being an assassin. Yet Heresy is not about being an assassin but exploring history and uncovering truths. Through well crafted characters and an intriguing storyline, it can capture your imagination and lead you on an entertaining journey without the buckets of bloodshed. If you’re looking to try something new, to explore the possibility of the Templars being good guys or to witness the events of the life of Joan of Arc, Assassin’s Creed: Heresy offers those opportunities. With its refreshing approach of minimalized violence in favor of suspense, intrigue and enjoyable characters, it paves a way for something new and enjoyable. As such, I give it a four out of five metal bikinis. It takes a non-standard approach that drives forward an engaging story that carries you from beginning to end and leaves you wanting more without feeling unsatisfied.